We have talked about the inevitability of time in walking out God’s promise for our career life. 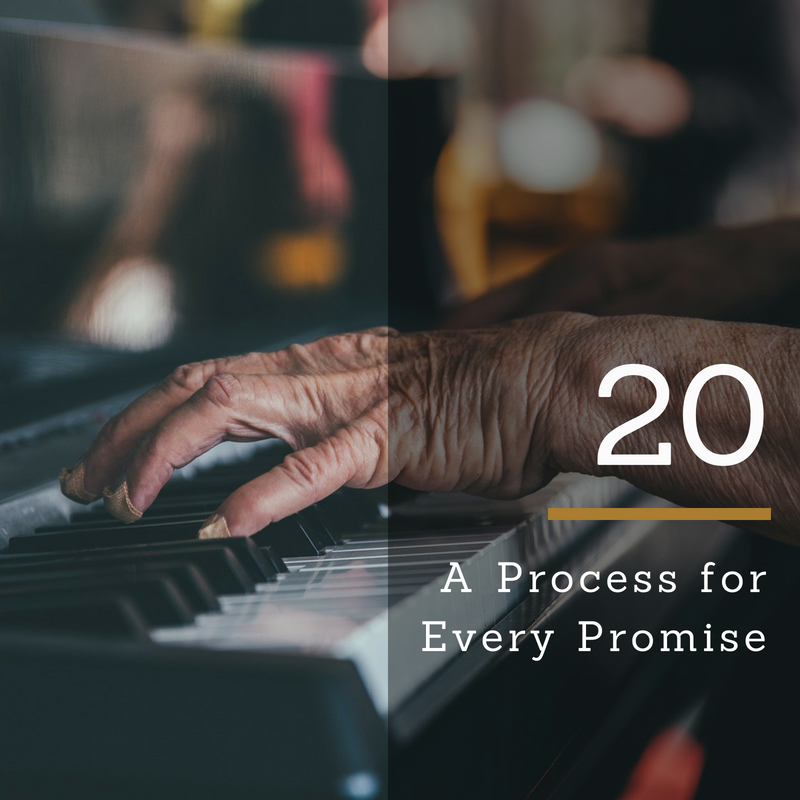 In this episode, we talk about the inevitability of process, forming us to thrive in the promise as we receive it. This past Saturday morning, I was taking a break from writing to cook myself some soup; and the Lord said to me, Every promise has a process. Then yesterday, I went to church with a dear sister and her pastor was talking about a vision the Lord gave him. Part of the vision was two images of buildings. The first image was of 3 and 4-story buildings. When he saw that image, he said the Lord told him This is not what I intended. Then the Lord told him, This is what I actually intended, and showed him a second image of buildings; but these buildings were skyscrapers. This led me to research how foundations are laid for skyscrapers and I came across the story about the Wilshire Grand Hotel here in Los Angeles, which is slated to be the tallest building west of Chicago. I learned about all of the massive work that has to be done in the foundation before the part that we see from the street can ever be built. The construction of the Wilshire Grand Hotel has been a massive feat, having broken several records throughout the construction process. After demolishing the original structure, they had to dig a foundation site that was five stories deep and the size of a city block. Then they had to create an infrastructure within the foundation with various systems to facilitate the pouring of 84 million pounds of concrete that had to be brought in by 2,120 trucks. Even before they were able to do that, they had to spend 6 months removing almost 250 truckloads of dirt every day. And before that could happen, there was massive research done to test the fitness of the soil on the site to handle such a structure. There was massive research in engineering and architectural planning to make sure that the design of the skyscraper could support its own weight and the weight of all the people and furniture that would go into it. They also had to make sure it would be able to deal with regional weather issues, which in Los Angeles are strong Santa Ana winds and earthquakes. It is interesting that Mr. Cho, the owner of the Wilshire Grand, had the desire to demolish and rebuild this site back in 1990. In reading about its process, it was a huge feat just to get to the point of laying the foundation. The pastor yesterday talked about the discouragement some of us encounter when foundation laying is happening in our promise. During this part of our process, it feels like things are going the opposite way; and they are. Here’s why: because, to lay a foundation for a skyscraper you have to start the project by going down. When you look at a skyscraper from street level, there is no indication of anything existing below what you see. At street level, we see the building going from the street up. And if we don’t know anything about construction, we could miss why there is any necessity for any movement down, when the building goes up. The Lord said every promise has a process. I once heard someone say that it takes a minimum of 10 years to create an overnight success. I think about my own journey and the amount of time it has taken for my foundation to be laid, which has been about 20 years. The reason I am able to talk so fluidly now about creating a harmonious relationship between faith, art, and career is because I this is what I’ve lived and this is how I live. I stayed in it, allowing time for the foundation to be laid so that I could walk in what God has given me to do. I am only now realizing that is what was happening. I just knew stay in it, don’t stop (no matter how hard it gets), and keep doing the next thing the Lord tells me to do. Every promise of God has an external and internal process to the full manifestation of that promise. In episode 13, we talked about the external process which was the fact that there are things that have to occur, come together things, and fall in place before that which you asked for can be delivered or manifested. But today we are talking about the internal, formative process. James 1:4 Amplified says but let endurance and steadfastness and patience have full play and do a thorough work, so that you may be people perfectly and fully developed with no defects, lacking nothing. The formation process is necessary so that when your skyscraper is constructed, when your promise matures, it doesn’t collapse on itself, it doesn’t topple, it doesn’t destroy you – because you have been tested, formed and equipped to handle the weight and responsibilities of it. The only thing that makes it difficult for us to weather this process is our own impatience; but it’s deeper than that. There is also a lot of fear in thinking that we will miss our window. If we don’t move now, or if it doesn’t happen for us now, we fear that age or the shifting of trends and taste will take away our moment of opportunity. But that is not true. What God has for you is for you. Ecclesiastes 3:1 says “to everything there is a season, and a time for every purpose under heaven.” The scripture says there is a time. That’s a declaration; not a question, and not a suggestion. Some of you may think: what if I miss my time? If you are following the Lord, and He is ordering your steps, there is no way you can miss it. But, let’s play and say that you do miss an opportunity. Isn’t He the God who redeems the time and makes crooked roads straight. If you allow Him to lead you, He’ll get you right back on track. If you pair that with Phil 1:6, where we’re assured that God is faithful to complete the good work He began in you, you can rest assured that no matter how long your process takes, there is a season and a time for your promise. Oh, and one more thing: save yourself some anxiety in your process by not comparing yourself to others. We all have processes of varying lengths and experiences. Give yourself permission to walk your walk.